ST. GEORGE — President Donald Trump signed proclamations Monday to formally scale back two sprawling national monuments in Utah: Bears Ears and Grand-Staircase Escalante. The proclamations reduce Bears Ears from about 1.35 million acres to 201,876 acres and Grand Staircase-Escalante from nearly 1.9 million acres to just over 1 million acres. 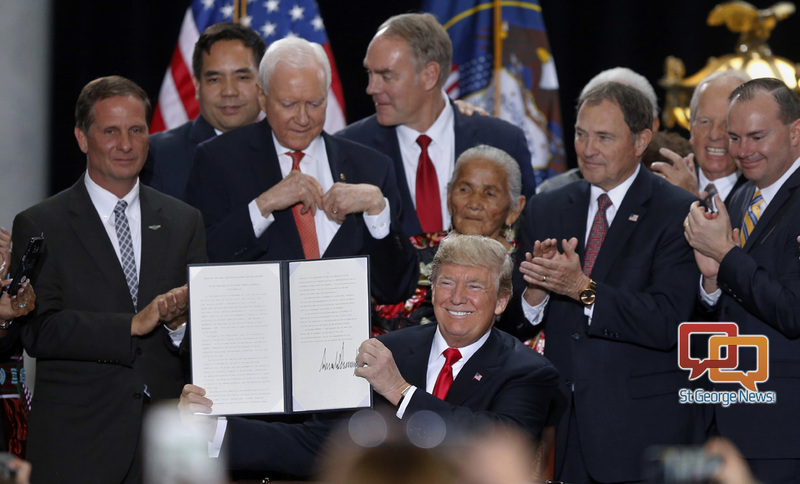 Trump traveled to Salt Lake City to make Monday’s long-awaited announcement and sign the proclamations, a move supported by Utah’s top Republican officials but opposed by some tribal members and environmental groups. In a televised broadcast of his speech at the Utah Capitol, Trump said past presidential administrations had “severely abused the purpose, spirit and intent of a century-old law known as the Antiquities Act,” a federal law that allows them to protect public lands by turning them into national monuments. “This law requires that only the smallest necessary area be set aside for special protection as national monuments,” he said. We have seen grazing restrictions prevent ranching families from passing their businesses and beloved heritage on to the children, the children that they love. We’ve seen many rural families stopped from enjoying their outdoor activities and the fact that they’ve done it all their lives made no difference to the bureaucrats in Washington. We have seen needed improvements like infrastructure upgrades and road maintenance impeded and foreclosed. We have seen how this tragic federal overreach prevents many Native Americans from having their rightful voice over the sacred land where they practice their most important ancestral and religious traditions. 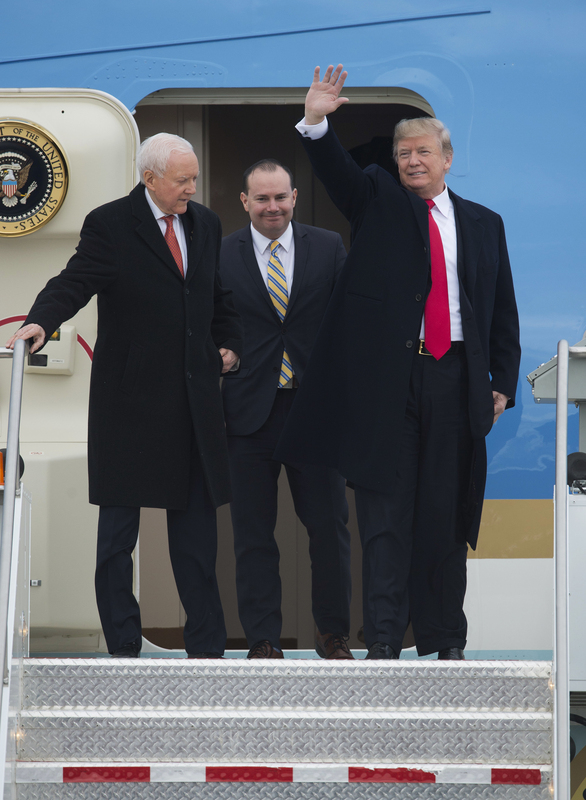 Others welcomed the president’s arrival in Utah and praised the proclamations. A handful of counter-protesters gathered in Salt Lake in support of the decision, among them Jason Lutu of Lehi who works in construction and says he’s in favor of potential drilling or mining that could create jobs. The president emerged from Air Force One in Salt Lake City to the adulation of an assembled ropeline crowd, according to White House Press travel pool reports. After greeting state officials, he made his way to the ropeline where he seemed to enjoy one family in particular with a Trump-impersonating son wearing a blond wig and makeup. The teen was accompanied by another teen impersonating Vice President Mike Pence. “I like this kid, I like this kid!” Trump said of his young impersonator. Before making his historic announcement at the Capitol, the president visited with leaders of The Church of Jesus Christ of Latter-day Saints and toured the church’s Welfare Square, which provides aid to the poor. The governor issued his statement following the ceremony. The Grand Staircase-Escalante National Monument resides in my district. I have seen firsthand the damage that the monument has caused to the local economy. My constituents have been in a desperate need of change, and today President Trump delivered. “President Trump had the courage that no other president had. He listened to local voices that had been left out of the decision-making process for too long. On behalf of the county commissioners, the state legislators who represent the area, and the entire federal delegation, we say thank you, Mr. President. San Juan County Commissioner Rebecca Benally, a Native American attending the signing ceremony, expressed her gratitude. 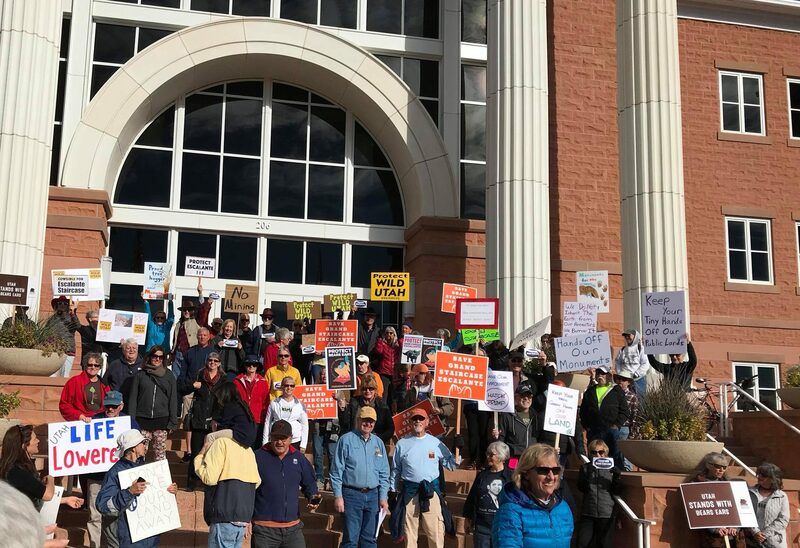 In Southern Utah, local activists led by a group called the Great Old Broads and the Grand Staircase Escalante Partners protested in St. George Monday morning, urging the president to not sign the executive orders. Chris Gorzalski, co-leader of the Southern Utah chapter of the group, expressed concern that the reduction would lead to extraction on the public lands, despite Zinke’s insistence that the move wasn’t an energy issue. Zinke said Monday there is coal in the Grand Staircase-Escalante area but no coal or oil in Bears Ears. His group is prepared to take this to the courts, Poe said. Organizations and businesses that are voicing displeasure with the president’s proclamations include the National Parks Conservation Association, retailer Patagonia, the Sierra Club and leaders of the five tribal nations that advocated for the creation of Bears Ears as a national monument. The move by Trump marks the first time in a half century that a president has attempted to undo these types of land protections. Information provided by The White House indicates presidents have modified the boundaries to remove lands from monuments 18 times in the past. The most significant reduction occurred in 1915 when President Woodrow Wilson halved Mount Olympus National Monument, which is now a National Park. Over the history of the Antiquities Act, national monuments have been reviewed and modified by subsequent presidents. It is no surprise, given the disproportionate original designations, that President Trump would reduce these monuments to be more consistent with the intent of the Antiquities Act. Such remedial measures would not be necessary if Congress would clarify the limits of initial monument designations. I echo the statement of Secretary Zinke that executive power under the Act is no substitute for congressional action. We are hopeful that our elected representatives in Washington, D.C. will pass legislation that makes political games with Utah’s public lands less likely in the future. AP Congressional Correspondent CATHERINE LUCEY, Associated Press writers Brady McCombs and Michelle L. Price in Salt Lake City and Darlene Superville and Ken Thomas in Washington also contributed to this report. St. George News Editor-in-Chief Joyce Kuzmanic and reporter Ric Wayman contributed to this report from St. George. Copyright 2017 The Associated Press as to AP portions of this report. All rights reserved. This material may not be published, broadcast, rewritten or redistributed. Nice move Thump. I am sure we will not have to worry about you protecting federal land when you leave office. Especially, if you leave office unexpectedly. I realize you needed to do this for your donors/lobbyists. In beer drinking terms: Dilly, Dilly! Great for Utah, great for the American people. Wait, wait….the progressive big brother loving fools will continue to lose more of their little sheep minds. Calm down commie snowflakes…. you will run the government healthcare system into even further debt and corruption. Remember this, Trump says hes above the law. And for a God fearing law abiding commie like you, thats saying something. Support your crook. Tge republicans have just set in motion a tax plan to add $1.5 trillion to the deficit, stupid. We can only hope that was snark and not the mentally deficient noise of what sounds like a 12 year old on bad drugs . What a great speech. Trump spent more time recognizing and giving credit to other people then I have ever seen another politician do. I love that he mentioned God repeatedly and praised the work of the people in this state. I love that he said you wanted this and I helped your elected officials make it happen. For someone that the media says is an egotist he was more down to earth and humble then I can ever recall seeing another President. Great Job President Trump! I appreciate what you are doing for our country. F Trump and his commie loving band of traitors who will take everything they can from the country, including integrity and spend, spend, spend on their lavish lifestyles. Anyone who thinks this band of crooks is up to ANYTHING good for the country is a fool in the lowest stupid sense. Get ready for higher prices on food, gas, healthcare, housing and just watch inflation sore. We have no friends left and our country looks like the 30% of the idiots who voted republican: crazed lowlifes who actually believe in this sexual deviate. Plus you all get Roy Moore, right up there with Warren Jeffs who would molest a 15 year old in a heart beat. Utah is az bad as Alabama, but full of meth heads. Go Trumpers, go straight to hell. Well now dumpy’s cronies who love ripping up land to fatten Their wallets can get on with it . I suspect most of them have long overdue projects to expand the elevators for their car collection garages . via the Back door electoral college and avoiding the will of the Ethical & Decent Majority . They should never be forgiven for the damage they are doing to the civilization millions have sacrificed to build . If anyone actually thinks 45 actually “believes in God” for reasons other than trying to gain votes with Christians, you are flat out delusional. The only thing he believes in is himself and his wallet. Taking back 2 million acres is a victory for individual freedom and states rights. New York has 0.4 % federal land ownership, 76% of Utah lands are owned by the federal government. The one national monument in NY has less than 10 acres of land designated around it. Two lame duck Democrats rode our of office by designating nearly 3 million acres off limits to personal recreation, horticulture, hunting and clean home industry like bee keeping. And they did it out of spite with no support from local leaders or state officials. What an abuse of executive power out of partisan spite. Thanks Donald Trump for caring about Utah. Curious if you have ever spent time at either place? Recreation: one of the biggest draws to GSENM is recreation hiking, canyoneering, backpacking, horseback riding, atv-ing, etc. What does beekeeping and horticultural have anything to do with monuments? And no land was regained or lost. It all was and remains federal property just now the management protocol will be slightly different. Hey dummy, the feds will still be in charge of the land. States rights have Nothing at all to do with this. Read, your ignorance is palpable. The Antiquities Act of 1906, (Pub.L. 59–209, 34 Stat. 225, 54 U.S.C. §§ 320301–320303) Get edjumecated before you call people dummy. And look into the Land Management Policy Act document. Only 18 states deal with that one. Figure it out by reading instead of listening to late night television and CNN. Look into the Navajo nation election too. This was not your average national monument. Money change hands and it probably has to do more with people stopping uranium mining here for less competition. You think Utah is mining that area any time soon your crazy and even more your crazy. Farmers and ranchers and tourist use that area before this land grab and have the ability to absolutely not allow ANYONE there! Now they can’t!